This subject may seem absurd to some people, it certainly has garnered responses of “you’re nuts” when being brought up as a cause for flooring material an installation failures, but rest assured, it is a legitimate issue. It becomes a bigger issue when you consider the green movement and it’s implications on start up of HVAC systems in new buildings. We’ve only seen the tip of the iceberg, in my opinion, on this issue.So why should varying temperature and humidity affect floor covering materials and how do they? As with all products, regardless of what they are, temperature and humidity have an effect. Carpet is reactive to the effects of heat and cold by expanding and contracting. Hard surface sheet goods and tiles do the same. Hard surface material, such as sheet vinyl, will also become brittle in extremely cold temperatures and could crack or break. Rolls of carpet when extremely cold can become as unruly to handle as wrestling a bear. On the floor, during swings of temperature and humidity, these flooring materials can contract allowing seams to open up. Suffice it to say that in cold temperature all flooring material is stiff, brittle, unpliable and difficult to work with. In warm or hot temperatures flooring materials are limp, pliable and easier to work with. Going from one extreme to the other during installation, whether from cold to warm or warm to cold, the flooring material will react. It does so by either expanding (growing) or contracting (shrinking). This is why it is so important to insure the space in which flooring material is to be installed, has a temperature and humidity that mirrors one that is comfortable for humans. If a human being would be comfortable in the space so will the flooring material. This temperature and humidity would be what the HVAC system would be set at when occupied as a work space. Humidity is important to flooring material as many flooring materials will absorb moisture. Nylon carpet for example, will absorb about 5% of its weight in moisture; wool about 27%, polypropylene is hydrophobic which means it will not absorb moisture. 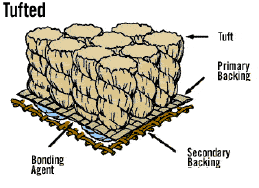 Since most commercial carpet is nylon, in a high humidity environment it will gain moisture and expand. It will also gain moisture from the adhesive when it is installed. movement of moisture does to, this is the law of physics at work. To deny this science is like denying human beings breath. Concrete should be thought of as a living organism. It is affected by changes in the environment. As moisture vapor moves in or out of concrete it affects the flooring material applied to it. 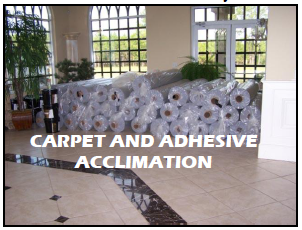 If the flooring material is permeable, like broadloom carpet, the moisture vapor can move through the carpet. In this process the moisture vapor brings with it the alkalinity inherently in the concrete. The alkalinity of concrete is at least 12.5 ph. material is the problem when the flooring material is only reacting to a condition. The flooring material gets blamed as the problem because it actually physically manifests a change instigating this interpretation. 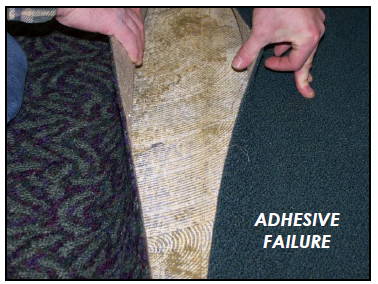 This is not to say the flooring material may not be the problem, especially in the case of carpet tiles but that’s another story. sight of what it is – a tree. To stay out of trouble think of wood flooring as a tree on the floor. Wood reacts to heat and humidity, it does it in the forest and it will do in on the floor. Wood gains and loses moisture which means it will expand and contract, which also means it will grow and shrink on the floor. check and lift off the floor. Even if you bolt wood to the floor you can’t stop this reaction if the space in which the wood is installed is not controlled. One of the biggest causes of flooring failures relative to the material coming off the floor and expanding or contracting is the cycling of the HVAC system or not controlling the environment in the space. This is easy enough to do but it also means the cost of operating the space is increased. Cycling the HVAC system lowers expenses and operating costs. When the space is not occupied by humans there’s no need to keep it comfortable for them but the flooring material requires the same comfort levels and when it doesn’t have that, it can and will react. One of the ways to prevent the flooring material from reacting violently to changes in temperature and humidity is to install it using a system that thwarts the reactions. Systems like EnviroSTIX for hard surface and hard backed flooring materials and FreeLay for carpet are systems that will help prevent the failure of flooring installations. There is more technology coming, most of which we are involved with. We’ll keep you informed to help you. In the meantime understand that temperature and humidity have a profound effect on flooring materials and the integrity of their installation. If you control the temperature and humidity in the space it will maintain the integrity of the floor covering and the installation. 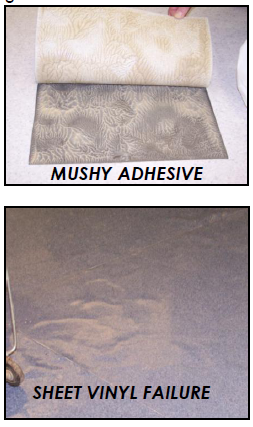 Effects of Temperature and Humidity on Floor Coverings.